For the first time, Antonov-32 (AN-32) transport aircraft of the Indian Air Force (IAF) carried out a successful landing at Sikkim's Pakyong Airport, one of the highest airfields in the country. Why is the landing significant? The successful landing has assumed great importance due to its strategic location of 60 km from the India-China border and it is located 4,500 feet above sea level. The successful landing is a booster for the Indian efforts which is aggressively overhauling the infrastructure, particularly in the North-Eastern region, following the Doklam standoff in 2017. 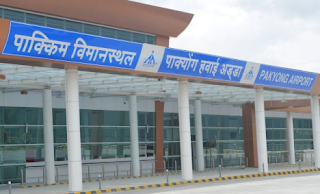 Pakyong Airport is a Greenfield airport near Gangtok, the capital of the state of Sikkim. It is the first greenfield airport to be constructed in the North-Eastern Region of India. The airport is strategically important and the Indian Air Force is also building on the ability to land certain military aircrafts at the Pakyong Airport. Prior to the inauguration of the Pakyong Airport by Prime Minister Narendra Modi on 24th September 2018, Sikkim was the sole state in India without a functional airport and Sikkim was dependent on the airport at Bagdogra in the neighbouring state of West Bengal, and Paro Airport in Bhutan. Q. For the first time, Antonov-32 (AN-32) transport aircraft of the Indian Air Force (IAF) carried out a successful landing at which airport of India's North-Eastern region that is one of the highest airfields in the country?